“I’m telling you, Clara…you have to stop living like a bird in a cage,” Mr. Douglas told Clara while visiting her parents one day. “Who are you? And, what do you mean by that?” Glugar said aggressively. “I didn’t know about that, Mr. Douglas,” Clara was surprised. “You mean, I used to be reckless?” Clara was getting nostalgic. “Ha-ha. I’m very powerful!” Glugar laughed. “Ugh, I hate when people make me feel like I’m the bad guy,” Glugar said grumpily. “Mr. Douglas, you’ve freed yourself from your diabetes?” Clara asked. “What do you do? What do you do?” Glugar got curious and excited. “Can you share some of your adventures with Glugar and me, Mr. Douglas?” Clara politely begged. “Mr. Douglas, what other stuff have you experienced?” Clara wanted to know. She was very interested with such conversation. “Dear Clara, other experiences have been even harder. Sadly, I’ve lived in places where people were at war and people were hurt almost every day, and one time I was even seriously injured myself,” Mr. Douglas sounded sad and thoughtful. “Those situations are not very common, I know, but from them I’ve learned that the most important thing is to find joy and satisfaction in all we do, that we have to definitely use our talents. Don’t allow your diabetes and your fears stop your dreams. You know that it’s very important to be cautious, and that living with diabetes is hard work. So, take the necessary precautions, but don’t hide your talents away and don’t stop exploring your interests. “Ugh, stop being a such a nuisance, Glugar. 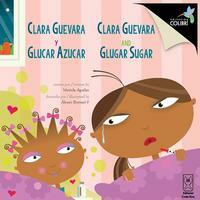 I think you’re just jealous because I’m stronger that you!” Clara smiled. “This story is dedicated to our family friend, Douglas Campos, who inspired me when I was recently diagnosed with diabetes.” M.A.